My Maternal Grandparents came to America from Italy in the early 20th century so I come by loving Italian food naturally. I remember my dear Grandmother making pasta in my Mom’s kitchen. Although I didn’t hand make this pasta and the recipe uses your favorite jarred pasta sauce it is delicious. You certainly could make your own sauce and use it here. I also like to serve some sauce on the side for anyone who would like more along with freshly grated Parmesan cheese. This is a great family style company dish that can be dressed up with a great salad and garlic toast. Refrigerate leftovers and reheat in the oven, not the microwave. Be sure to use a large sauté pan or your mixture may overflow. Buon appetito! Drain reserving 1 cup of pasta water, cover and set aside. In large skillet over medium heat, cook beef, onion and garlic; stirring frequently 6 to 8 minutes or until beef is browned. Drain fat. Stir in 5 cups spaghetti sauce and reserved pasta water. Reduce heat and simmer 10 minutes. Mix the meat/sauce mixture with ziti. 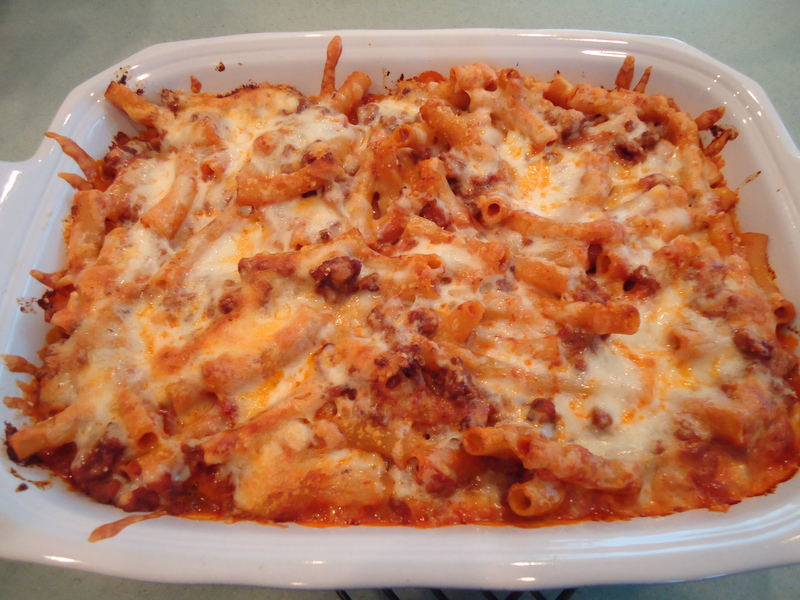 Spoon 1/2 of ziti mixture into 13x9x2″ baking dish. Sprinkle with Mozzarella and 1/2 of Parmesan cheese. Top with remaining ziti mixture and remaining 1 cup spaghetti sauce. Sprinkle with remaining Parmesan cheese. Bake 25 – 30 minutes or until heated through. Aside | This entry was posted in Beef, Comfort Food, Entrees, Sunday Dinner and tagged Baked ziti, Italian, Italian dinner, Italian night, pasta, pasta dinner, ziti. Bookmark the permalink. I love baked ziti! This is a great and simple recipe! Thanks for sharing! I hope you enjoy the recipe as much as we do. It’s a favorite in our house!